RMA book wins 2015 Historic Preservation Award! 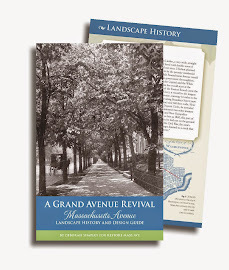 Our new book, A Grand Avenue Revival, has won the 2015 District of Columbia Award for Excellence in Historic Preservation in Public Education. The award is made annually by the DC Historic Preservation Office with cosponsors. "This award hugely strengthens our campaign to persuade Embassy Row stakeholders to invest in green elements that revive the original landscape in a way appropriate for the 21st century," said RMA President Deborah Shapley. "We hope it will make more people turn to this book, because it shows others how to 'green' their streets, besides serving as a guide to our landscape projects here," she said. Order your free print copy here or download the pdf. Co-winners are the book designer, Cutting Edge Design (Sally Murray James, principal), and Gill Fishman Design (Gll Fishman, principal). The Fishman firm designed RMA's web site and brand to enhance RMA's book and historic program. The firm also won a Graphic Design USA Award for the new RMA logo. The public is invited to Constitution Hall on May 6, when 13 Historic Preservation awards will be presented to 43 individuals, firms and organizations. Those attending will see a video about each winning project. 7 pm awards ceremony; reception follows. the Preservation Office event page. The event will draw a Who's Who of planners, preservationists, and leaders concerned with the capital city. DC Mayor Muriel Bowser is expected to attend. 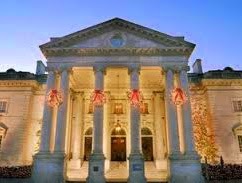 The venue will be appropriatly grand: Constitution Hall was designed by John Russell Pope for the National Society of the Daughters of the American Revolution (DAR). It was built in 1929, the era when many "palaces" were designed along Massachusetts Avenue to fit among the landscape of majestic trees already there. Restore Mass Ave's award adds an environmental dimension to this year's winners. "We are reviving the landscape that connects and explains Mass Ave's architecture and purpose, while showing how "greening" will help the city in future," Shapley says. The Historic Preservation Office, part of DC Office of Planning, cosponsors this annual award with the DC Preservation League and the DAR. We at RMA welcome news that another winner will be Sally Berk, a well-known architectural historian and Kalorama neighbor, who will receive the Individual Lifetime Achievement Award. Go here for the 2014 Historic Preservation Awardees and videos about those projects.